We are reference in Apartments for short stays for days and longer stays, one of the Vacation apartments in Valencia Best rated, to live Valencia from within. We try to make your stay in Valencia unforgettable attention to detail and offering the best price / quality ratio. 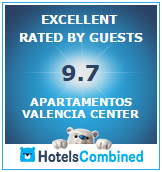 Apartment Valencia Center wishes you a pleasant stay in Valencia.